Another day, another dollar, and another review! The "another dollar" part is really the only unrealistic thing here, but that's unimportant! What IS important here is that SuperPhillip Central has Circle Entertainment's Fairune 2 to cover. A game filled with exploration and adventuring, Fairune 2 happened to be an entertaining experience overall. See how with the SuperPhillip Central review. 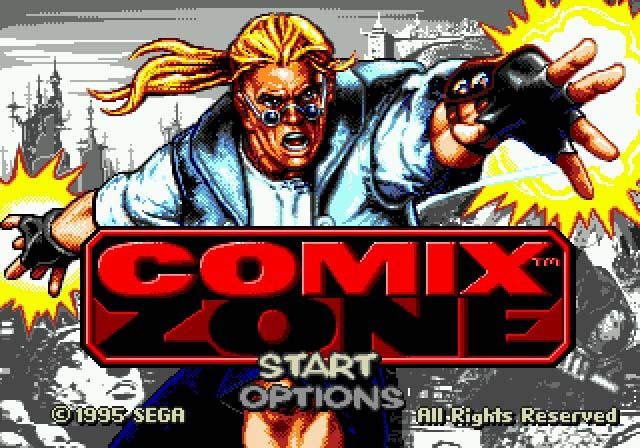 Circle Entertainment has been a fine localizing partner for many games that might otherwise never leave the East. Games of multiple genres and types come pouring out of the publisher, and the quality is generally quite favorable for them to keep doing so. 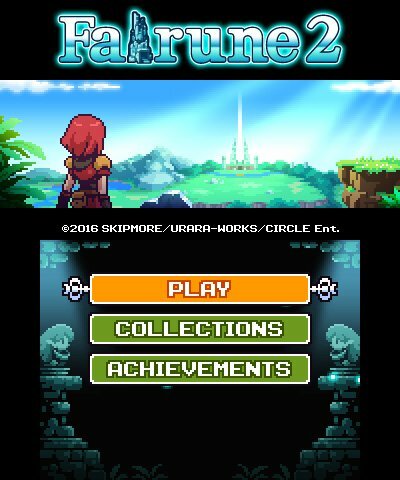 The latest game published by Circle Entertainment is Fairune 2, a game hearkening back to a more old school design. Thankfully, this old school design does not make for an antique of a game. Fairune 2 is part RPG, part adventure game. Really, the main focus of the game is exploring a myriad of maps to attain items to discover ways to progress further in the game. The main goal of Fairune 2 is to save three faeries from their imprisonment in the game's three main areas. Along the way you'll further the rather bare-bones story, but at the same time you'll most likely be enjoying yourself. Fairune 2 is not the type of game that holds your hand. You're immediately set loose into a plains area where some modest exploration gives you a sword. This sword is your means of attacking enemies, but there really is no complexity to combat. All you do is walk into an enemy sprite, and that foe is defeated. Depending on your experience level, you'll lose some HP and gain some experience. The lower your level compared to the enemy you collide with, the more HP you lose and the more experience you gain. 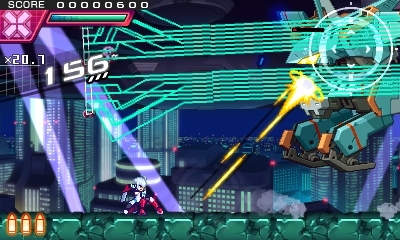 Early in Fairune 2 you'll find yourself defeating enemies while taking zero damage and gaining zero experience. 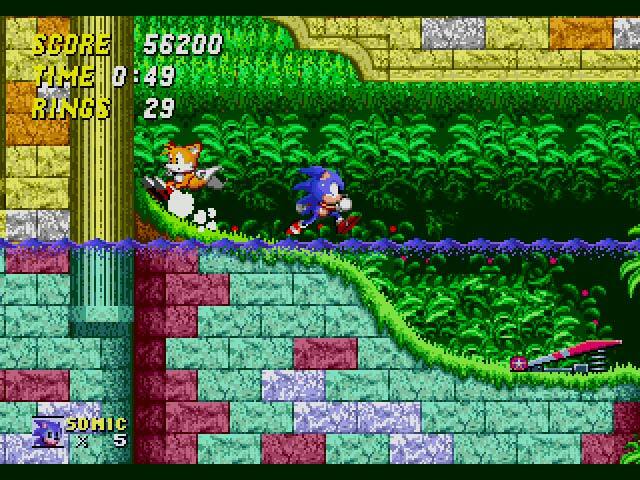 However, as you progress through the game, you're always taking on new enemies with greater strength, so there is usually always something new to gain experience from, and thus, new levels. Even enemies that give no experience or cause no harm are worthwhile because they can occasionally drop money. Combat is a bit of an afterthought in Fairune 2, but it does serve a small purpose. So, really, the RPG and combat aspects of Fairune 2 are really just their to check boxes. They're not really important to the overall game or feel very iterated on. The true fun from Fairune 2 comes from the game's adventuring aspect. While the various maps of the game aren't too terribly big, they do house a lot of fascinating points of interest, many of which you will probably not be prepared to tackle right away. This is usually due to not having the correct item in your inventory. 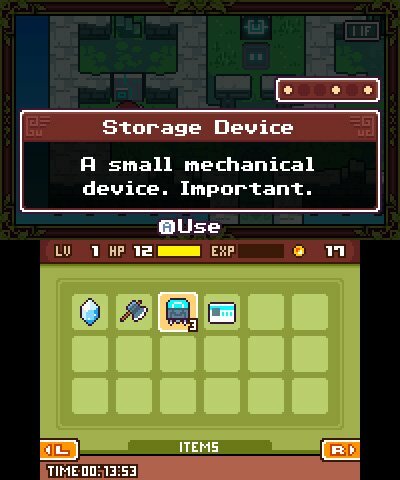 Yes, items are a really big part of Fairune 2. Generally in the game you're walking around areas searching for the right order of steps to do to make progress. For instance, finding an axe allows you to cut down a specific tree, which in turn allows you to use that tree's logs to build a bridge to access a new section of the game. This specific order in which you have to do things may make for an appearance of linearity, but there are secrets hidden in Fairune 2's world that are completely optional to find to add to some good reasons to search every nook and cranny the game's various lands possess. You'll come across a wide assortment of items in Fairune 2, each with their own specific uses. Again, Fairune 2 doesn't hold your hand. There are no hints to be found. All that will assist you in the game is your own observance of the game world in which you explore. It's not just as simple as having the correct item. You have to realize when it's the right moment to use it. Even when you have the correct item, you might not know when, where, or even how to use it. 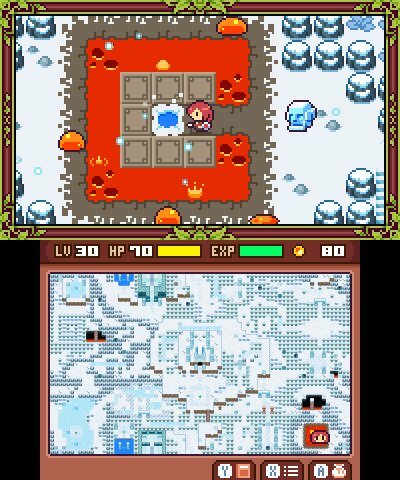 Without spoiling the fun of figuring this out for yourself, there is a specific area in the snow world of Fairune 2 that requires you to use something in your inventory in a nontraditional way to find your way through a Legend of Zelda Lost Woods-style maze. When you finally get what you need to do, and not just in this example, it's such a rewarding feeling and "ah-ha" moment. Sometimes a puzzle won't even require an item, but through careful examination of the environment, the solution will usually present itself. 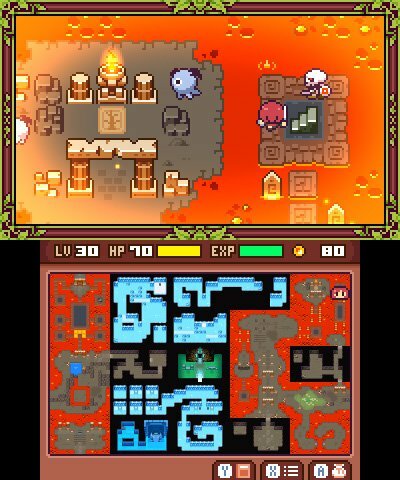 Solving puzzles with and without the use of items is the main element of gameplay in Fairune 2. 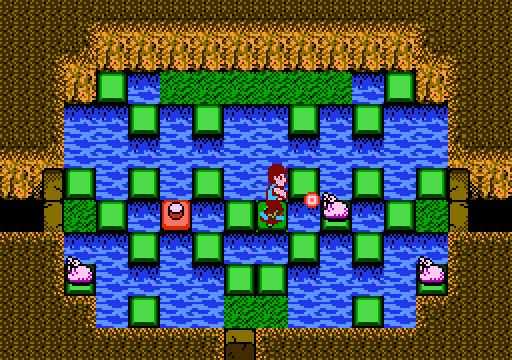 Occasionally, there are some frustrations with the adventuring aspects of Fairune 2. 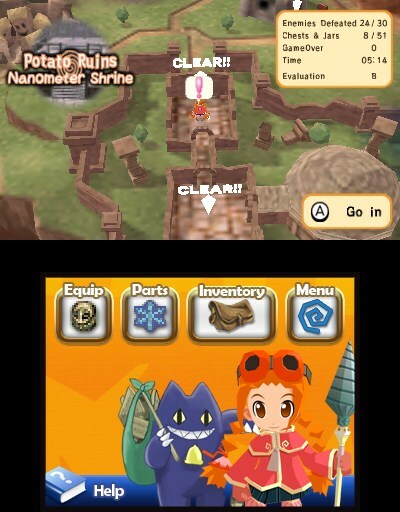 There is a lot of backtracking to be found in this game, and sometimes you don't know the item that you need is actually in a past area you've already visited. This means you can search up and down, left and right, and forwards and backwards through an area before you finally figure out that area doesn't have the item you require. The frustration increases as more and more time goes by before it finally dawns on you that what you're looking for isn't in your current area. Fairune 2 is a rather lengthy adventure to do everything in, taking anywhere between 8-12 hours. That's a mighty good amount of time for the cost of the game. There are an assortment of achievements to try to tackle as well-- things like simply beating the game to doing so without a sword, or properly filling out every map. Then, your play time will increase even more through going after these additional goals. 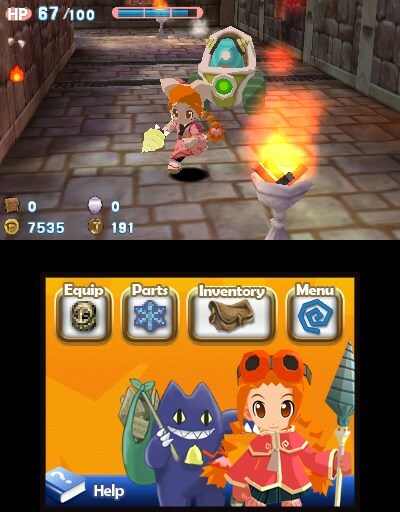 The bottom screen's map is a blessing for getting your bearings. Sporting a lovely retro art style, Fairune 2 dazzles with its colorful areas and simple but appealing sprites. The music is also suitably and charmingly retro, offering a catalog of catchy songs that even after repeatedly venturing through each area does not get grating on the ears. 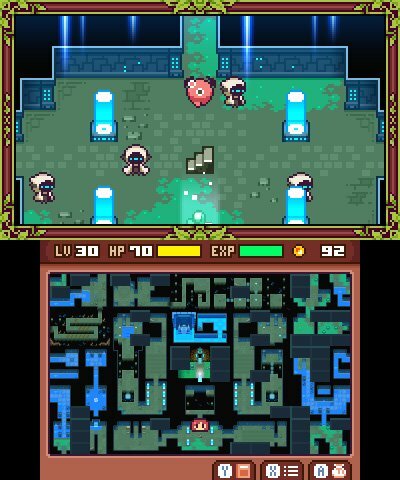 Despite being on the Nintendo 3DS, Fairune 2 does not sport any depth effects with the 3D slider. It's 2D all the way, which will at least save your battery to have extended sessions exploring the world of Fairune 2. Fairune 2 is a marvelous adventure that works due to the logic of its puzzles. Every solution makes sense in some regard. There's never a feeling of "how was I supposed to know that" that ever shines through in the game. Occasional bothers like the throwaway combat and backtracking do hinder the experience somewhat, but overall, Fairune 2 delivers old school charm and old school game design influences without feeling antiquated. Review code provided by CIRCLE Ent. Here's a rather dark and macabre title for Halloween, coming early next week. 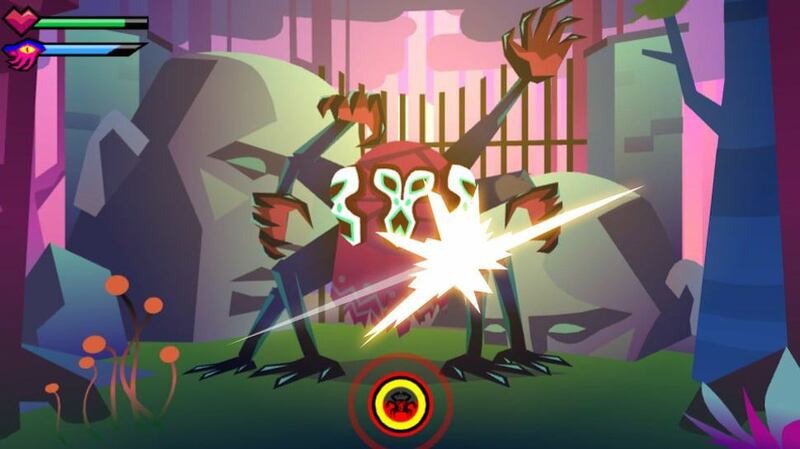 It's Severed, from the team behind Guacamelee. It's a stark contrast compared to their past game, but like Guac, it's definitely worth checking out. Here's the SuperPhillip Central review. A cut, slice, and slash above other dungeon crawlers. After playing through Guacamelee!, I became a big fan of Drinkbox Studios and watched their content with eager eyes. After the lighthearted humor that Guacamelee holds, I wasn't quite expecting Drinkbox's next game taking a much different approach. Underneath its vibrant, colorful, and mysterious world, Severed houses an emotional tale that will keep players engaged from beginning to end. And if the story doesn't do that, then the combat and exploration certainly will. 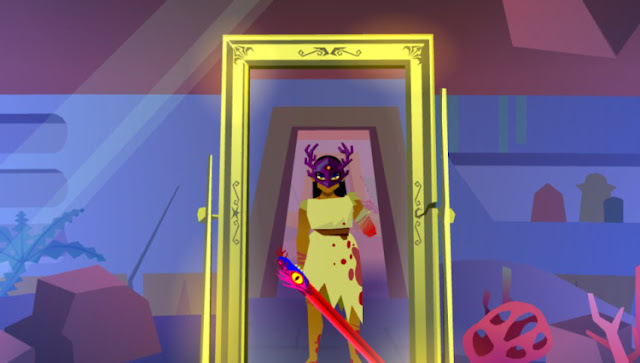 Severed begins with your character, Sasha, standing before a mirror. Notably missing from her body is her left arm, just a stump dripping with blood. A brief flashback reveals how Sasha lost her limb as well as how she was separated from her family: her mother, her father, and her brother. Heeding the words of a cloaked, ethereal figure, Sasha takes a sword and wears her mother's armor, venturing out into a dangerous world. Right away you'll notice a very different tone compared to Drinkbox's previous game. If you've played a first-person dungeon crawler before, then you might feel right at home with Severed. You move square by square, turning left and right, and moving forwards and backwards through relatively claustrophobic areas from forests to puzzle-filled dungeons. Some squares on maps are empty, devoid of any challenge, while others hold a monster or two (or three, or four) to fight, a switch to pull, or some kind of puzzle to solve. The monsters Sasha encounters throughout her journey are quite the interesting beasts. Some have spider-like characteristics while others are just monstrous amalgamations that really show the enemy designers' creativity. The actual combat against these creatures is full of fun. There is ample strategy to consider rather than just using the stylus to furiously slash at foes. Slashing can be performed with long strokes for heavy damage or quick, short strokes for lighter attacks. Enemies don't just sit there and idle by as Sasha strikes them either. They can defend by covering up their weak point through curling into a ball, using their arm to shield themselves, among other tactics. 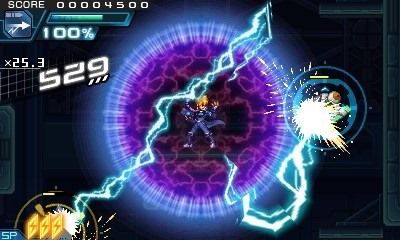 Enemies each have a circular gauge that when full, initiates an attack from them. By slashing in the exact opposite direction of their intended attack, Sasha can block the enemy's offensive advance. Missing the timing or failing to slash at the right angle results in Sasha taking damage. When an enemy's attack gauge is full, get ready to block with a correctly aimed slash. 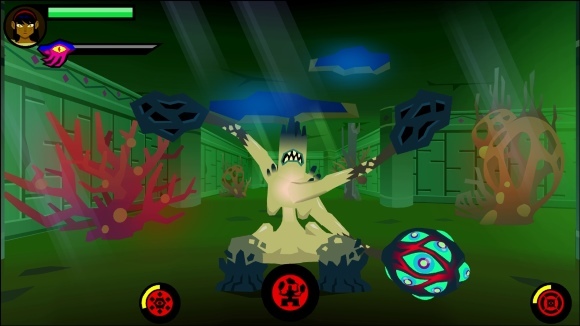 The idea of strategy in Severed's combat really comes to light when taking on more than one foe at a time. Generally the maximum amount of enemies Sasha can take on at once is four. Through you eyeing each enemy's attack gauge you can plan which foe to attack first. Sometimes attacking a foe will lower that enemy's attack gauge so you can engage a more dangerous foe. You really have to prioritize which enemy you go after, when to spin around to block an enemy before they can cause you damage. 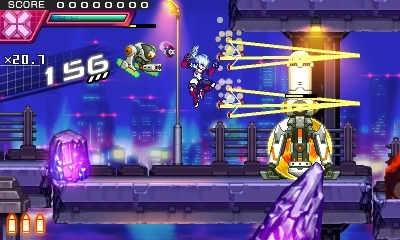 It gets mighty challenging in some later battles where you have to constantly spin around and face enemies to prevent them from causing hurt to Sasha. Then, there is something that is introduced in the second half of Severed known as buffs. These produce one or multiple benefits to enemies, such as a faster filling of a foe's attacking gauge, greater attack strength, greater defense, health regeneration, and the ability to block magic completely. These buffs make you want to prioritize which enemies you go after even more. Perhaps a foe with health regen should be saved for last so you can take out that baddie's buddies first so when you're distracted by another foe, that health-regenerating foe won't be healing himself as you're dealing with his friends. 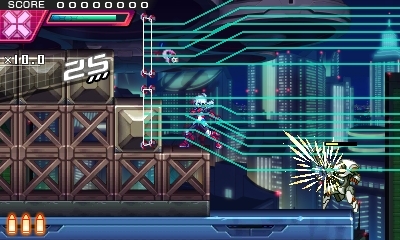 Each foe tries to block Sasha's strikes in varied ways. For the most part, Severed's slashing and slicing with the stylus feels really good. It feels much more accurate to me than using my meaty finger, which not only covers up the screen but also doesn't give me the same surgeon-like precision of the stylus. The precision works fantastically for when you can slice off (i.e. sever-- so THAT'S one of the ways this game got its name!) the limbs, wings, eyeballs, and more of various enemies. This can occur when your focus meter is at its fullest when you defeat a foe. Each time you make contact and damage an enemy, your focus meter fills. If one of your attacks is blocked before the meter is filled, it empties completely. The actual severing of enemies isn't just some cool, morbid means of Sasha showing her enemies who's boss. The limbs and extremities that fall from foes are used in three skill trees to enhance her abilities. Things like increased damage, slower enemy gauge speeds, greater defense, and more are available by spending extremities. It makes you want to focus in battle so your meter can fill and you can get the opportunity of trying to carve off enemy eyeballs, limbs, wings, and other macabre collectibles. The great thing about this is that Sasha's skill trees in my save file weren't completed until close to the end of the game, so there was no grinding necessary. Now, I said Severed's slashing and slicing with the stylus, and in general, feels really good, but I started that sentence with "for the most part." 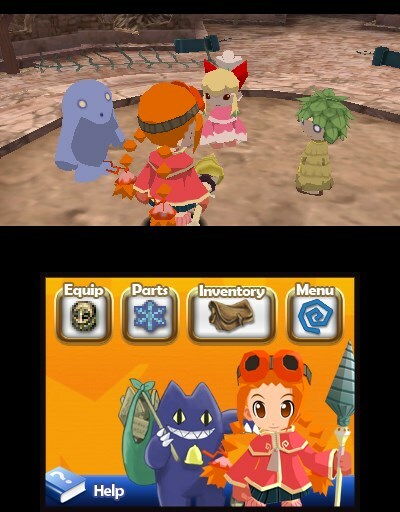 A problem that frustrated me throughout my play time with the game was when charged attacks were concerned. To perform a charge attack, you hold the stylus (or your finger) on the touch screen for a brief amount of time while your sword powers up. When the charge is full, you are supposed to slash the enemy. This is required later in the game for foes with rock armor on one or many of their extremities. 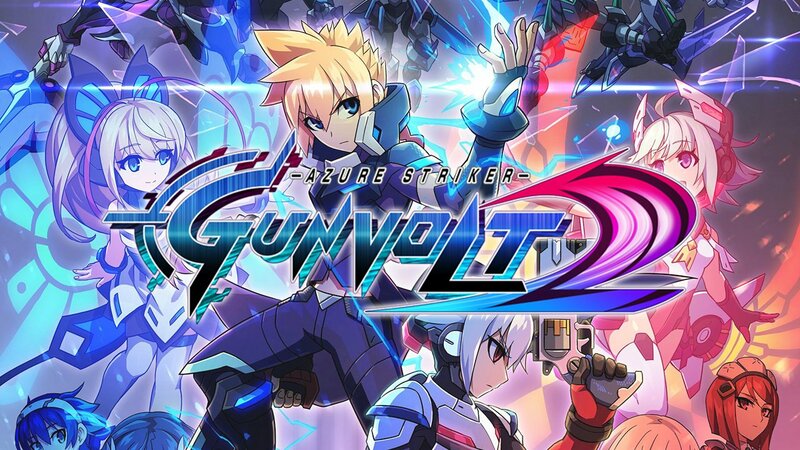 Unfortunately, the game is very inconsistent with whether or not your slash after charging up actually registers. 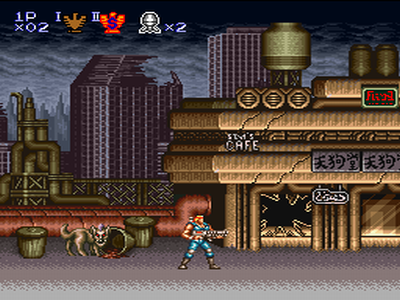 This is a big deal when facing four enemies, all with rock armor that needs to be knocked off with charged attacks. Not a deal-breaker for the game, but my biggest problem with Severed all the same. Don't let this foe's attack gauge get full or else it'll launch this painful spore attack. As you play through Severed, Sasha gains new abilities that assist in both combat and exploration. The latter is great to open up new areas of places Sasha revisits that house anything between shortcuts to other areas or health or magic meter-boosting items. 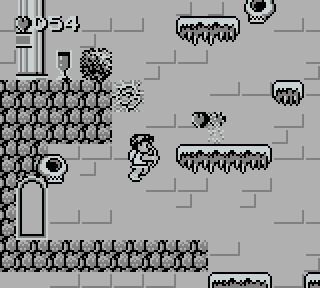 For instance, a mask that Sasha acquires can use its eyes to open up specially marked walls to reveal passages, while in combat it can freeze enemies who don't have the magic defense buff. 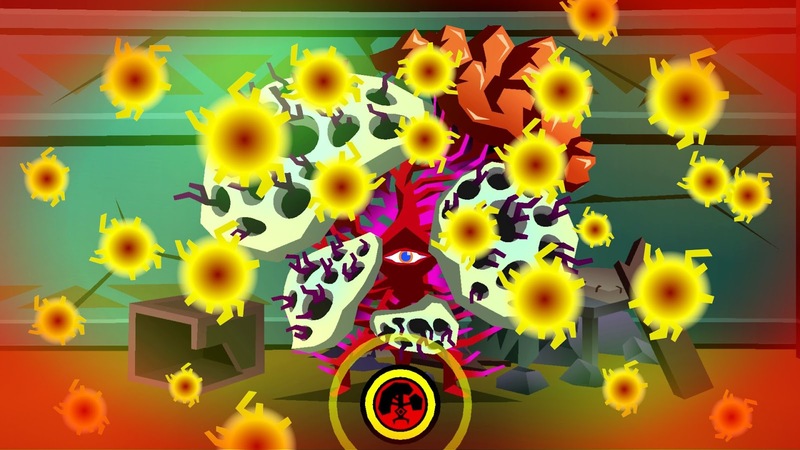 There might be no reason to think much about the Nintendo 3DS version of Severed-- I mean, the PlayStation Vita version came out this past spring and plenty of players have been able to enjoy the game since. 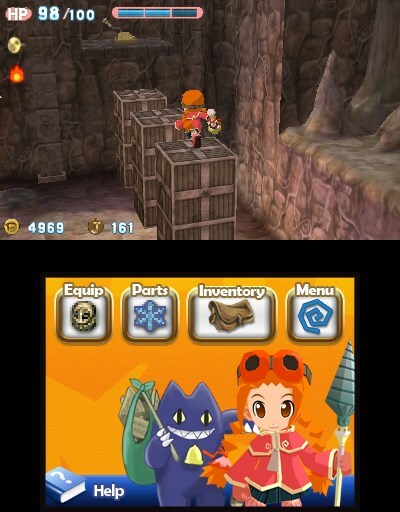 Fortunately, the 3DS port has some advantages that come in not only the aforementioned stylus controls, but also exploration is easier. You can assign a map to the top screen that displays a grander view of the current area you're in rather than a smaller map set to the top right corner of the actual game view. I found myself looking at the map often to get acquainted with areas, see where I needed to go, where I haven't gone, and it made getting lost a not-too-common experience. 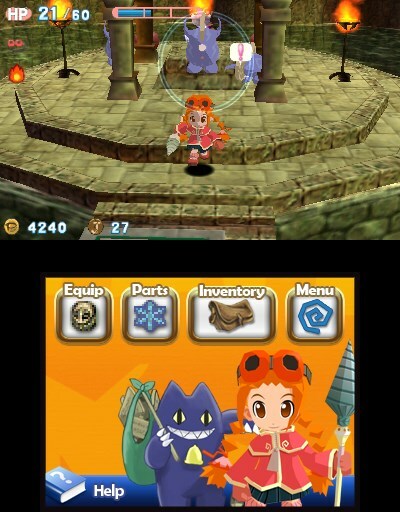 The 3D effect isn't really used to great benefit because of having the map on the top screen, but you can also have gameplay mirrored on both screens if desired. First-person dungeon crawlers are often full of rustic, earthy areas saturated in brown and dark colors. Compared to those games, Severed easily separates itself from the crowd with its delightfully vibrant and bright visuals. Even places like caverns that you'd expect to be devoid of anything but dark brown hues are interesting to look at. The enemy design was talked about earlier, but I didn't go into just how marvelously these creatures animate. The designers could have gotten away with expressing personality in only their appearance, but how they animate makes them even more impressive. 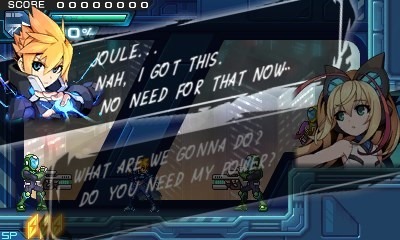 Meanwhile, the music features various atmospheric tracks as well as some tense tunes when the situation calls for them. I couldn't really recall these songs if you asked me to away from the game, but they fit rather well for Severed, and that's really all one could ask for. Memorability is just gravy in this case. Despite one annoying control gripe regarding charge attacks, Severed is an insanely enjoyable first-person dungeon crawler that uses its touch-based combat smartly to great effect. The game doesn't outwear its welcome, telling a heartfelt and tragic tale that you can't help but hope will end well for Sasha and her family. Exploration is engaging, battles are strategic and tense, and you seldom ever feel you're just going through the motions. After the one-two combo of Guacamelee and now Severed, I eagerly anticipate what comes next from Drinkbox Studios.